Those from the “F’ relief of Plate 4 (positions 91-100 on the left and right sides of the printing plate, a variety of the Scott No. 6 imperforate stamp and the No. 19 perforated stamp). Those from the “E” relief of Plate 4 (positions 41-50 and 81-90 on the left and right sides of the printing plate, a variety of the No. 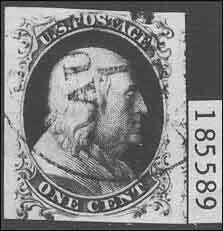 8A imperforate stamp and the No. 22 perforated stamp). Scott still lists both the No. 6 and 8A imperforate varieties together as No. 6b, a new listing; and the No. 19 and No. 22 perforated varieties together as No. 19b, another new listing. But in both cases, it does mention both the E and F reliefs, pointing out that the best examples of Type Ic come from the F relief. A copy submitted to the PF as Scott No. 6 and described on its certificate as Type Ic, with partially missing lower right plume and ball. Only 56 of more than 2,500 off-cover 1851 and 1857 1-cent stamps turned out to be this scarce Type. In studying more than 2,500 copies of the l-cent stamp since 1945, the PF’s Expert Committee has recognized 23 imperforate copies and 33 perforated copies of Type Ic. The Type Ic stamps noted in Tables 1 and 2 are combined and split into their four sources in Table 3, as recorded in the PF records. The earliest recorded certificate for a Type Ic is numbered 2329 and dated March 6, 1950. It describes the Type Ic as a variety of No.6.